The name, San Xian Wontons (三鲜馄饨) is hard to translate. Roughly, I guess one could translate it to, “Triple Delight Wontons,” because the filling contains three proteins––shrimp, pork, and chicken. 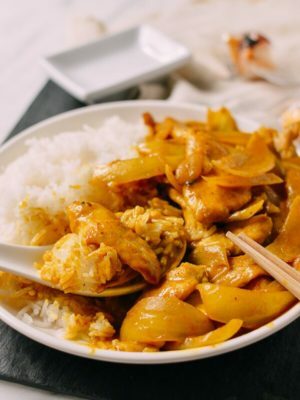 Just don’t let the name fool you into thinking this is an Americanized takeout recipe. Far from it! Hand-chopped meats taste so much better than machine-ground, i.e. 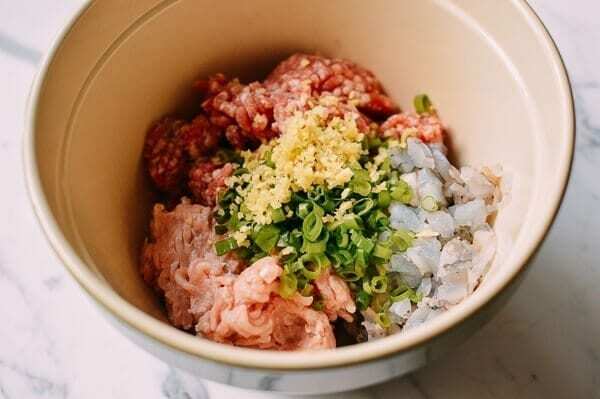 pre-ground meat that you will find in the grocery store, which can have a mushy texture. 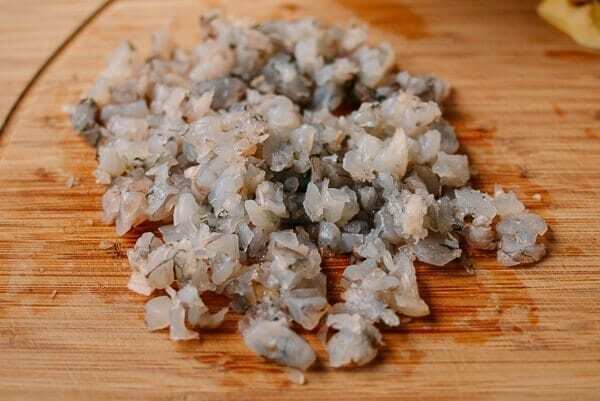 Don’t mince the shrimp, just coarsely chop them to maintain the shrimp’s firm texture. 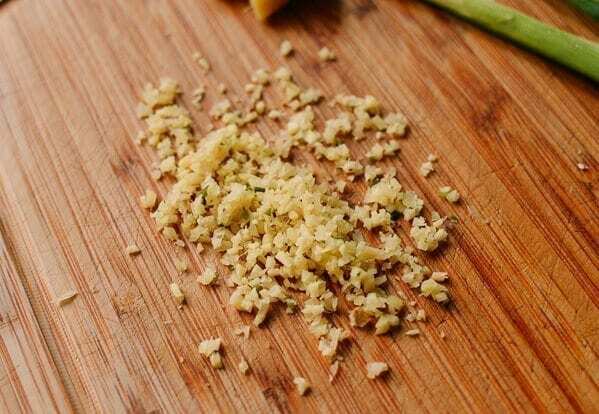 Aromatics like ginger must be minced very finely. 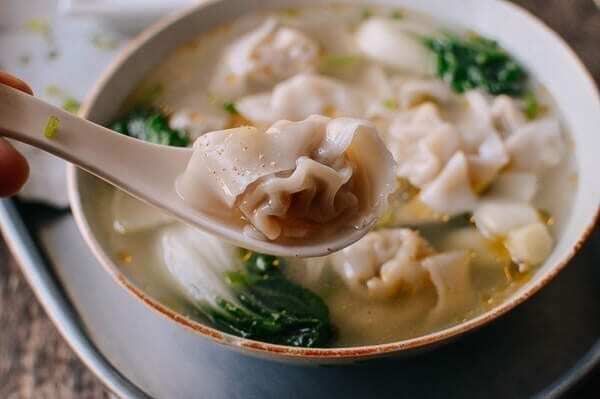 Larger pieces of ginger will ruin the wontons’ delicate flavor. 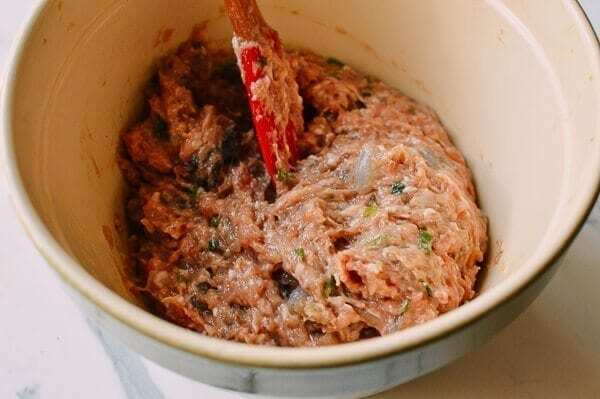 Always stir the meat filling in one direction, and stir until the filling comes together and turns sticky–like paste. 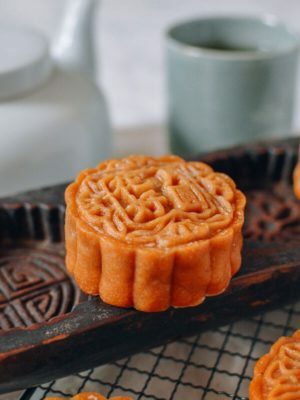 It’s very important to add cold stock or water to the filling to keep the filling moist and juicy. In this recipe, I added ½ cup of water to the filling. ALWAYS taste-test the filling by cooking the first two wontons (or dumplings if that’s you are making) before making the whole batch. Then you can adjust your seasonings to taste. The size of the wrapper determines the amount of filling to use; otherwise, it’s difficult to seal them. 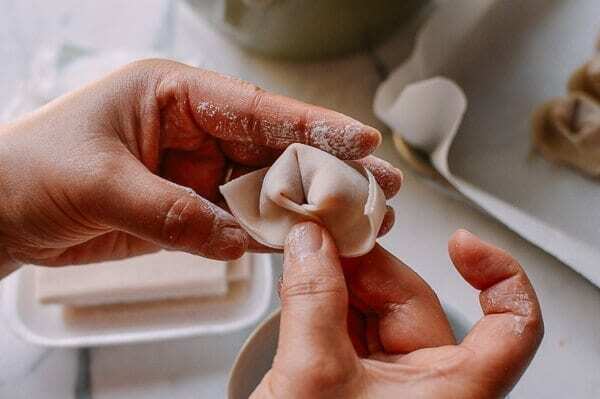 Start with less filling and adjust as you are folding the wontons if needed. If you’d like to store them in the freezer, place them on a sheet pan lined with parchment paper and slightly separated so that they aren’t touching. Freeze them on the pan overnight. 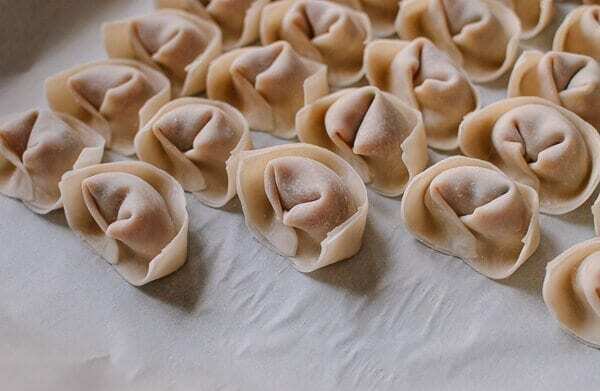 Transfer them to a zip-loc bag once they are frozen solid, but don’t leave the wontons uncovered in the freezer for more than 12 hours, because the wrappers will crack if they are left uncovered. Never defrost frozen wontons (or dumplings for that matter) in preparation for cooking. They should go into hot water or a frying pan frozen. 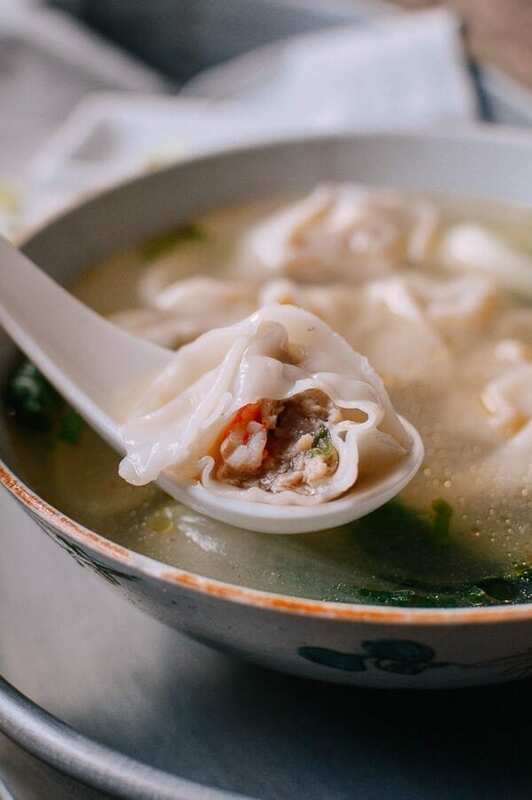 Wontons are best boiled in water and then served in heated clear soup stock. 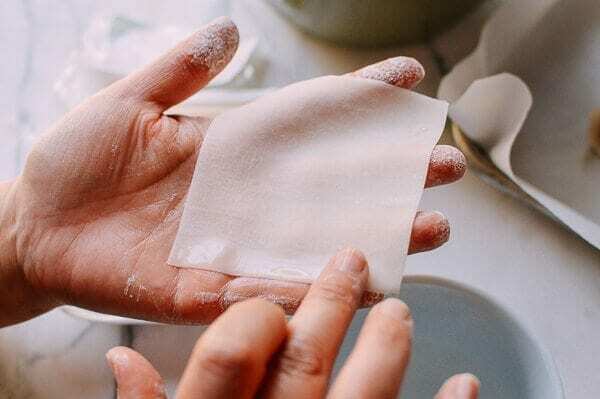 In my opinion, cooking methods like steaming, pan-frying, and frying all dry out the filling too much, because the wonton skin is a lot thinner and more delicate than dumpling skin. 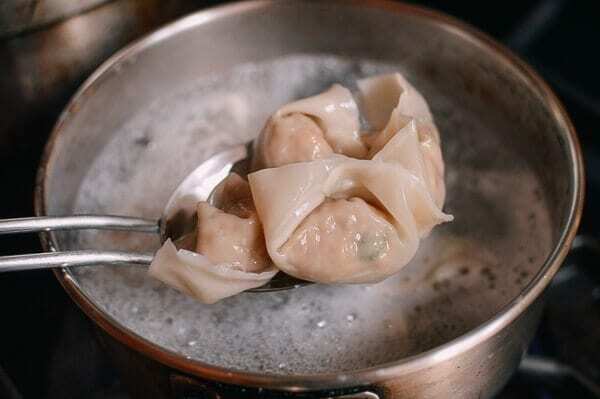 When cooking wontons (this applies to dumplings and noodles, too), bring the water to a boil. Then add the wontons while slowly stir the water, this will prevent wontons from sticking to the bottom. Once the water comes to a boil again, add ½ cup of cold water to stop the boiling process. 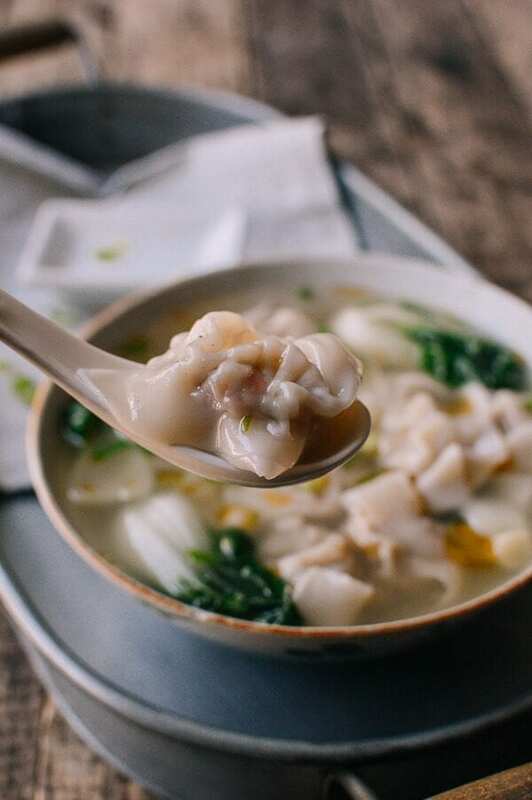 This method will slow down the cooking process so the wontons don’t turn starchy and mushy. Wontons are almost done cooking once they flow to the surface. Cook for another minute and serve. This San Xian Wontons recipe makes about 7 dozen. Are you ready for a treat? Let’s start! 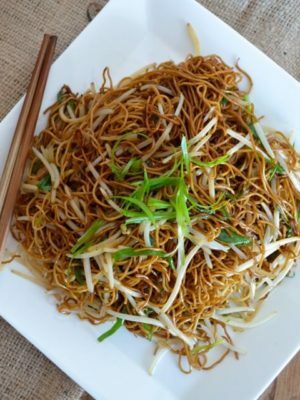 To make the San Xian Wonton filling, combine the shrimp, pork, chicken, minced ginger, chopped scallions, vegetable oil, light soy sauce, oyster sauce, sesame oil, white pepper, and water. Using a rubber spatula, mix and fold the mixture in one direction for about 5 to 10 minutes until it becomes sticky, like a paste. Prepare a large sheet pan lined with parchment paper. Get a small bowl of cold water. Lastly, bring a small pot of water to a boil, so you can taste-test the filling. To assemble the wontons, take your square wonton wrapper, and dab one side of the square with your finger. Add about a teaspoon of filling in the center. Gently fold the wrapper in half and seal on all sides. 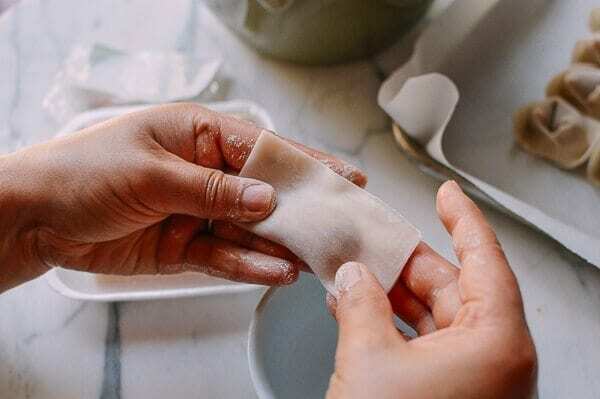 Using your finger, brush another dab of water on one corner (of the filling side), and gently bring in and overlap the two corners of the wonton by pressing them together. Place on the parchment-lined sheet pan. Make one more, cook, and taste test the two samples. Make adjustments accordingly to taste before proceeding to make the whole batch. To cook the san xian wontons, boil water in a pot, and add the wontons (fresh or frozen, but never defrosted wontons). To prevent the wontons from sticking to the bottom of the pot, stir the boiling water gently so the water is moving when you add in the wontons. Cook uncovered for about 3-5 minutes using medium heat. 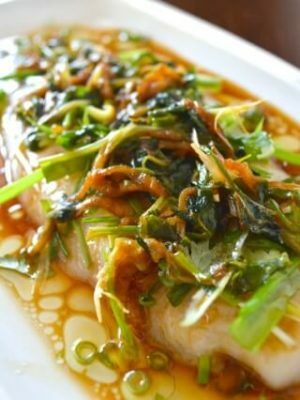 This is also a good time to blanch some leafy greens to complete the meal. If necessary, add ½ cup cold water if the water is boiling too vigorously. This helps manage the starch levels in the water. The san xian wontons are done once they float to the surface and turn plump. 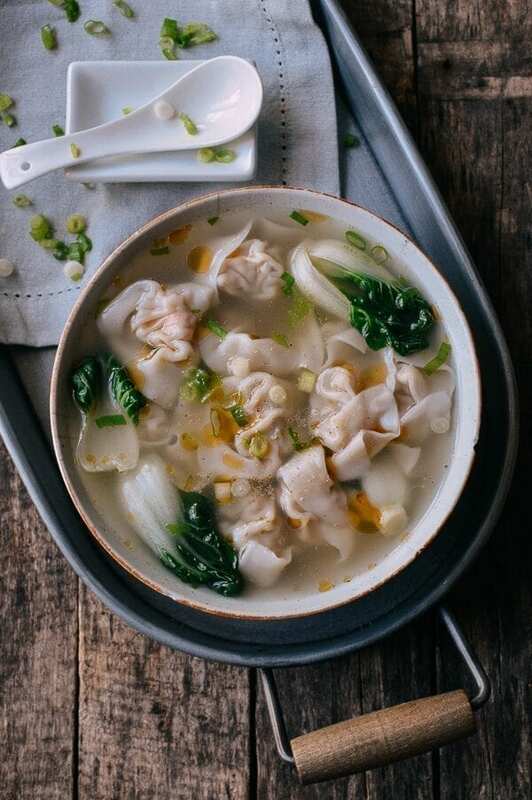 Since it’s best to serve wontons with stock or broth, it’s a good idea to heat up the stock or broth at the same time as you’re cooking the wontons. I like to use chicken broth or a mixture of chicken and pork broth, which you have to prepare ahead of time. 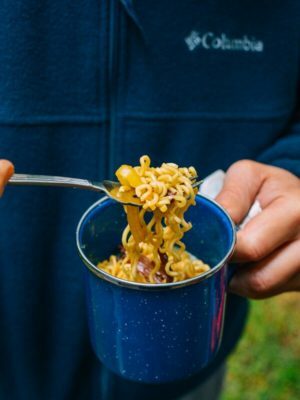 More times than not, I just use the water that I cooked the wontons in. This is my trick for when I am in a pinch–you can give it a try too. I first add light soy sauce, sesame oil, ground white pepper, and chopped scallions to the soup bowl. Then I ladle in the cooked wontons and some of the cooking water, stir, and salt to taste. Enjoy your San Xian Wontons! 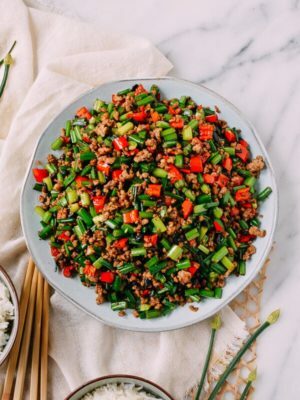 To make the filling, combine the shrimp, pork, chicken, minced ginger, chopped scallions, vegetable oil, light soy sauce, oyster sauce, sesame oil, white pepper, and water. Using a rubber spatula, mix and fold the mixture in one direction for about 5 to 10 minutes until it becomes sticky, like a paste. 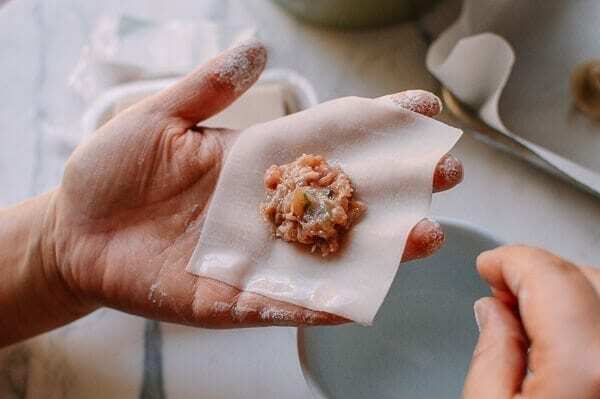 To assemble the wontons, take your square wonton wrapper, dab one side of the square with your finger, and add about a teaspoon of filling in the center. Gently fold the wrapper in half and seal on all sides. 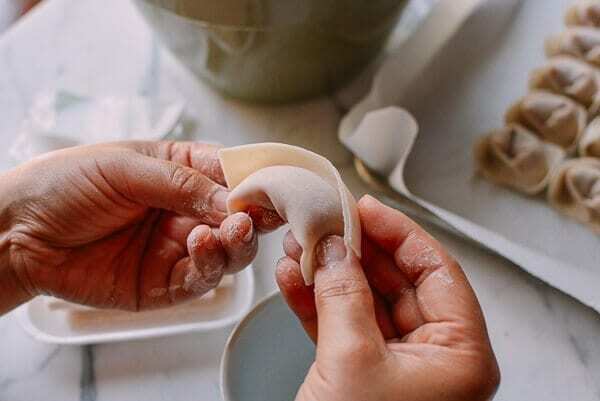 Using your finger, brush another dab of water on one corner (of the filling side), and gently bring in and overlap the two corners of the wonton by pressing them together. Place on the parchment-lined sheet pan. Make one more, cook, and taste test the two samples. Make adjustments accordingly to taste before proceeding to make the whole batch. To cook the wontons, boil water in a pot, and add the wontons (fresh or frozen, but never defrosted wontons). 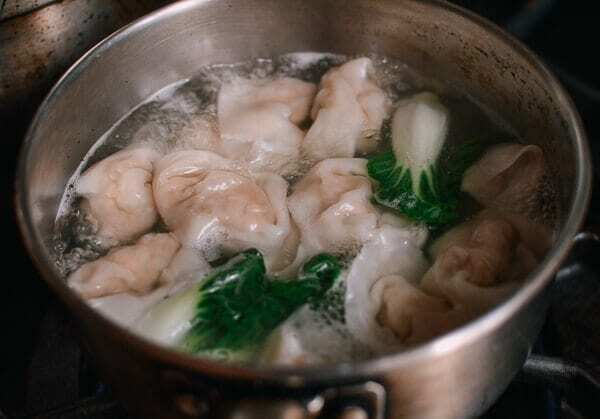 To prevent the wontons from sticking to the bottom of the pot, stir the boiling water gently so the water is moving when you add in the wontons. Cook uncovered for about 3-5 minutes using medium heat. 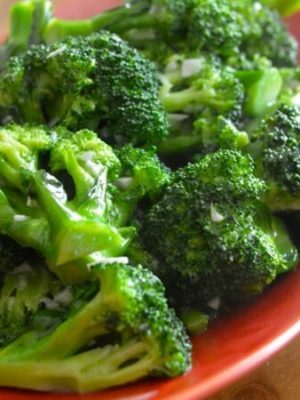 This is also a good time to blanch some leafy greens to complete the meal. If necessary, add ½ cup cold water if the water is boiling too vigorously. This helps manage the starch levels in the water. The wontons are done once they float to the surface and turn plump. 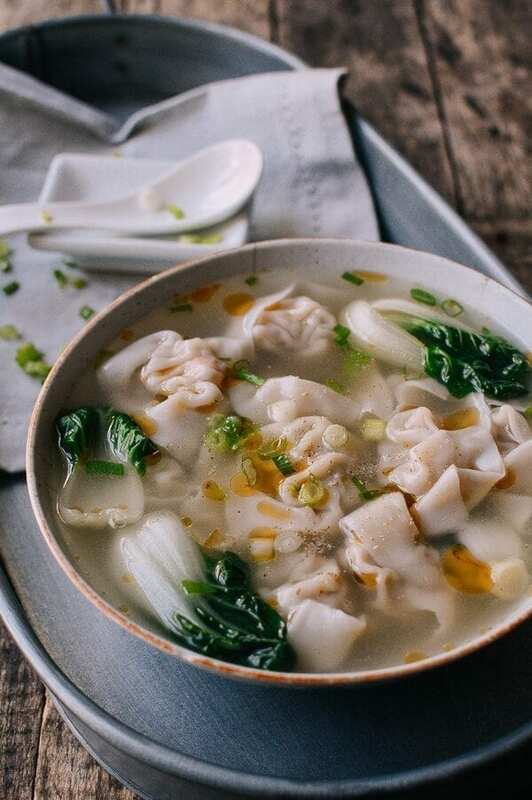 Since it’s best to serve wontons with stock or broth, it’s a good idea to heat up the stock or broth at the same time as you’re cooking the wontons. I like to use chicken broth or a mixture of chicken and pork broth, which you have to prepare ahead of time. More times than not, I just use the water that I cooked the wontons in. This is my trick for when I am in a pinch--you can give it a try too. I first add light soy sauce, sesame oil, ground white pepper, and chopped scallions to the soup bowl. Then I ladle in the cooked wontons and some of the cooking water, stir, and salt to taste. Wow! I’d actually made these and they turned out great! 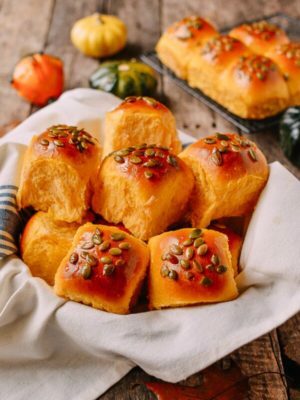 Thank you so much for the recipe and step by step instructions. I’d missed the homemade won tons my grandfather used to make when I was a child. These brought back memories. Thank you so much. That’s great, Susan! Thank you for your comment. 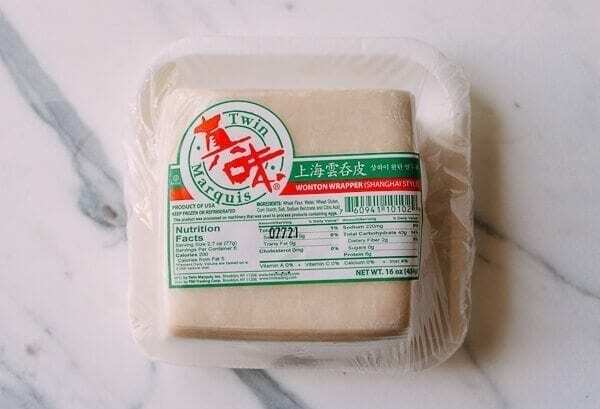 How long would you cook the frozen wontons for? Pretty much the same as written in this recipe. The fact that they are frozen only means it will take slightly longer for the water to re-boil and for the wontons to float to the surface. Don’t over-cook or the wrappers will break. 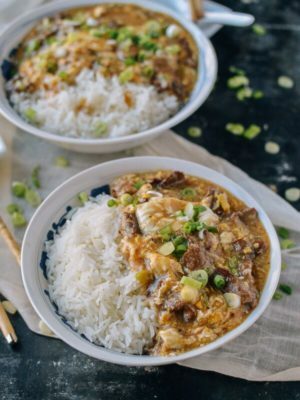 I use your site constantly to decide what I’m going to make that week for dinner, and this has to be one of my favorites. We actually use the recipe for homemade chili oil to make the sauce from your spicy sichuan wontons recipe, and eat it with these san xian wontons!! 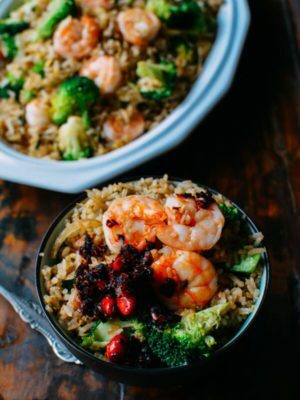 The shrimp makes the filling so bouncy and good. 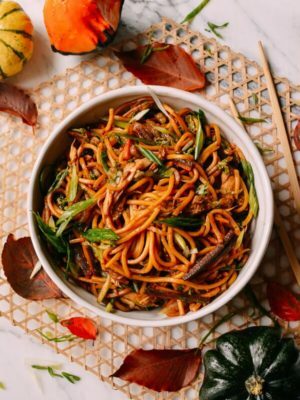 These are all the recipes I’ve been looking for and done so easy to understand!! Thank you-perfectly presented! You are so welcome, Lin! 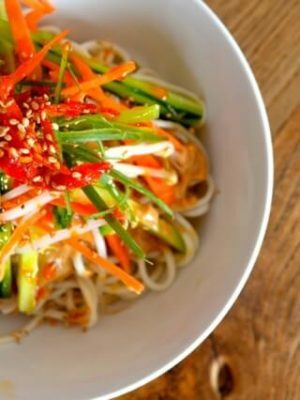 Great wonton recipe! The family loved this! Thank you Judy! Awesome! Thank you for leaving us a comment. So what exactly was red inside the wonton in the final picture? Hi Thos, it’s a piece of shrimp. Hi, first I love your blog!! Second I have been spending the afternoon “trolling” your blog for dumpling recipes. Can I ask an ignorant question? What is the difference between dumplings, won tons, and pot stickers. They seem basically the same, but also different. I am just learning to cook them, always just went out to eat them. Thanks! Hi Jackie, they are mostly the same. The differences are in the shape and sometimes the thickness of the wrapper. 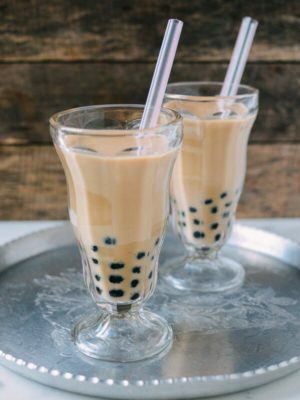 Oh, I absolutely MUST try these! 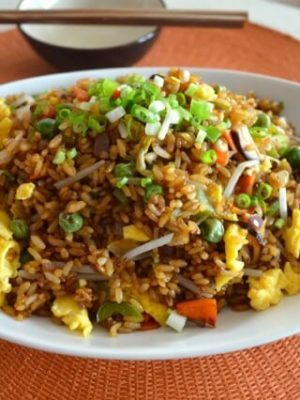 The recipe is so simple and my Chinese wife will love my lao wai bottom even more, hehe! Looks good! Can we make the wontons and freeze it UNCOOKED? If so, how long can it be stored safely in the freezer? Thank you. Absolutely, Ela! They’re good in the freezer for up to a month or two.